The concept of stem cells can seem a complicated one and you may have seen foreign words such as 'pluripotent' written in magazines or discussed on television. Stem cells describe all of the cells that can give rise to the different cells found in tissues. There are however, different types of stem cells. 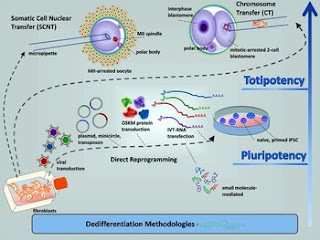 One such type is a pluripotent stem cell. What Are Pluripotent Stem Cells? Pluripotent stem cells are often termed 'true' stem cells because they have the potential to differentiate into almost any cell in the body. This means that under the right circumstances, a stem cell that is isolated from an embryo can produce almost all of the cells in the body. Yet after this embryonic development stage is over, the stem cells no longer have this unlimited potential to develop into all cell types. Their pluripotency is thus lost and they can only become certain types of cells. What Makes a Stem Cell Pluripotent? To understand how a cell becomes pluripotent, it helps to consider the human body in the very early stages of development. After an egg is fertilised by a sperm, a single cell results. This cell - the fertilised egg that is totipotent - has the potential to create an entire organism. In the initial hours and days following fertilisation, this single totipotent cell divides into more totipotent cells that are exact copies of the original. Approximately four days after fertilisation, the totipotent cells start to specialise and form a cluster of cells known as a blastocyst. The blastocyst has yet another smaller group of cells known as the inner cell mass and it is these inner pluripotent stem cells that will go on to create most of the cells and tissues in the human body. These pluripotent stem cells are therefore different than totipotent stem cells because they don't develop into a complete organism. As such, a pluripotent cell won't give rise to the placenta or other tissues that are vital for foetal development. It will still develop into the other specialised cell types in the human body, such as nerve or heart cells. You may have also heard the term 'stem cell line.' Stem cells from embryos can be used to create these pluripotent stem cell 'lines,' which are grown in the laboratory or cultured from foetal tissue. Embryonic stem cells are isolated from the inner cell mass of the blastocyst. The embryos are excess ones produced from in vitro fertilisation, but the practice is still controversial because it does destroy the embryo, which could have been implanted to create a baby. Embryonic germ cells are taken from aborted foetuses and these pluripotent cells are derived from very early cells. These early cells are those that can become sperm and eggs. Embryonic carcinoma or cancer cells are isolated from a type of tumour that sometimes occurs in a foetus. Pluripotent stem cells provide a chance to obtain a renewable source of healthy cells and tissues to treat a wide array of diseases such as heart disease and diabetes. Burn victims and those who suffer from autoimmune diseases such as Parkinson's can all potentially benefit from the use of pluripotent stem cells. Pluripotent stem cells have a vast potential for the treatment of disease, namely because they give rise to the majority of cell types in the human body. These include muscle, blood, heart and nerve cells. Another potential use for pluripotent stem cells involves the generation of cells and tissues for use in transplantation. Pluripotent stem cells can evolve into specialised cells that ultimately can replace diseased cells and tissues. Drug research is another area that pluripotent stem cells may benefit. Animals are a commonly used model to assess the safety and use of drugs. Instead of initially testing drugs on animals, they can be evaluated through testing on cells grown from pluripotent stem cells. Those drugs that appear tolerated and safe can then progress to testing on animals and finally, humans. Often, the discoveries with the greatest therapeutic benefits present the most difficult challenges; this is particularly true for pluripotent stem cells. Researchers are attempting to learn ways of controlling the development process of pluripotent stem cells into the many different cell types in the human body. Another current challenge is that the cells used in research are rejected from a person's body due to their immune system. More controversial is the fact that many scientists and members of the public have ethical issues with the use of pluripotent stem cells from human embryos or foetal tissues. The positive uses of pluripotent stem cells are enormous but new research and ethical challenges must be taken into account before the public can reap the full benefits. For those who suffer from the many diseases that may be treated by pluripotent stem cells, additional knowledge and research will hopefully come sooner rather than later.